Knife people are nice people, that’s what I have found. Knives are fun, yes, they are, but the people we are associated with while playing knives make it all the more fun. 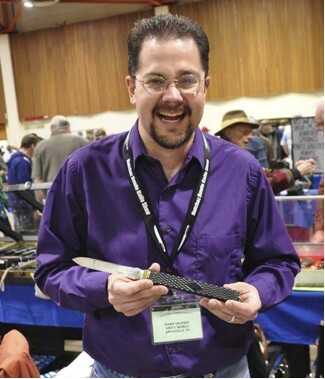 Mark Zalesky, editor of Knife World, is one of these fun people. 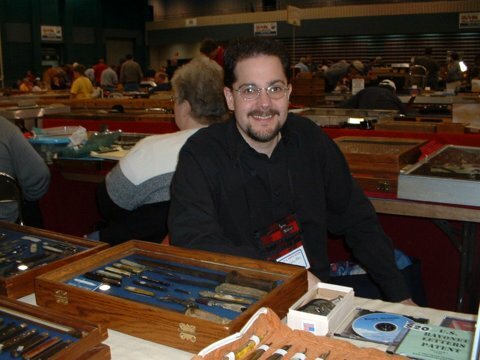 Extremely quick wit, great sense of humor, vast knowledge of knife history, love for the hobby. Sometimes a bit hard-headed, but a great guy and someone I count as a friend- knives or not. I love his editorials- Irons in the Fire. He can get fired up there every now and then too. Recently, David Anthony, author of Tidioute- A Town With An Edge, interviewed Mark and agreed to share it with Cutlery News Journal for us to enjoy. If you know Mark you can actually hear his voice in his quotes, if you don’t, then you will by the time the interview wraps- up. Rather than attempt to rewrite it and re-publish its images (some great knife shots included), I elected to post it as an attachment- PDF format. I hope you enjoy getting to know Mark. He’s a great guy and a Cutlery Hall of Famer, if there is such an organization. If not, he should be the first inductee. Thanks David for providing this sit down with Mark, as well as your passion for our hobby! We are extremely fortunate. In the big scheme of things our world of knife collecting is but a speck in the universe of collectibles and yet, we have several monthly publications tailored specifically to our hobby. My sentimental favorite is Knife World. I got started on it because I liked old pocket knives and to me, Knife World was the best fit. I have not been disappointed in a single issue. Knife World is balanced in its articles. Obviously, I lean toward Knife History- all things related to the who, what, when, where and why of the knives and the companies that made them. KW is the only pub that allows an emphasis on early American cutlery history. Knife World isn’t about glitz, glamor or glossy cover stock. Instead, it is about quality content. One of my favorite sections is Mark Zalesky’s Irons in the Fire. There he lets it all hang out. No sacred cows. All is fair game. Fortunately he hasn’t taken aim my way yet, but may well one day. You can also go to KnifeWorld.com and do an index search. Then you can order back issues til your heart is content. 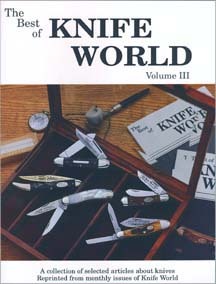 In the past they have published The Best of Knife World. These are truly gems. Find them if you can. There were three editions published. I am fortunate to have most of 20 years of issues. I love to take the time to grab a few, hop in bed and read the dusty things. The articles are timeless. And while some of the past articles are more “meaty” than others, almost all have interesting knife factoids. When you have time read how it all got started and KW’s history. I’m thankful to have Knife World and hope you are too. You know by now, I enjoy reading through old cutlery publications and early American knife company history. I’d like to start this week off by sharing with you something I found extremely interesting. Can you imagine how difficult it would be to attempt to classify all the different kinds of knives made around 1900, in addition to identifying all the different cutlery firms that made each kind? Do we even know how many different types of knives were made back then? 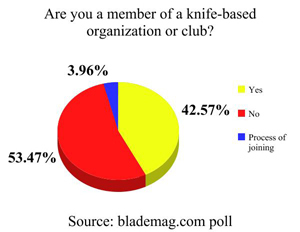 Plus, how exactly do we know a knife’s intended use? All you have to do is read Bernard Levine’s Whut Izzit? column in Knife World each month and his expert attempt at identifying and classifying knives (among other things) to see how difficult it must be. Recently, while I was doing my pleasure reading, I came across a classification of all knives made around that time. It was published in September 1919 and was compiled by The Cutlery Publishing Company, publishers of The American Cutler. The publication is The Cutlery Makers of America. While there are no pictures (other than in the advertisements), the list of the types/classifications of knives is very interesting. 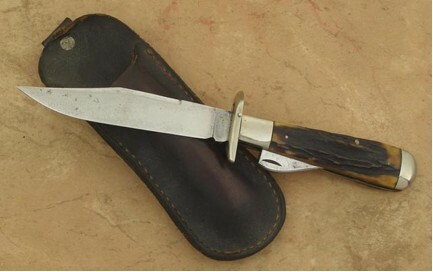 Today, we may call a certain type of knife by another name, or no name at all, but this directory lists the types of knives and the firms who made each as classified by this official directory. D. Divine & Sons, Ellenville, N. Y. Golden Rule Cutlery Co., Chicago, Ill.
Lackawanna Cutlery Co., Nicholson, Pa.
Schrade Cutlery Co., Walden, N. Y.
Incidentally, the next classification in the directory is Pocket Knives: Advertising- Safety Push Button- The sole maker listed is Schrade Cutlery Co., Walden, N. Y. Today, I simply wanted to introduce this invaluable directory for those of us into American cutlery history. 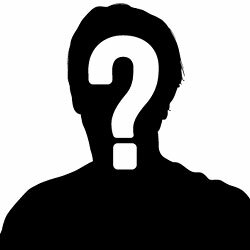 I’ll highlight a couple of other topics you will like later this week.